Cable tie bases with an adhesive backing. Simply stick the base to a surface and attach a cable tie. Ideal for keeping groups of cables snug to a wall for example. 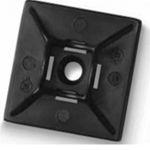 The bases also have the option of adding an additional central screw fixing for more heavy duty uses.